X2O Media has introduced Xpresenter 3.0, the newest upgrade to the Xpresenter PowerPoint-based content creation software designed for use with X2O's digital signage network. The latest release gains integrated content management, which is designed to add efficiencies to creation and scheduling. The new content management feature operates directly within the PowerPoint interface. The software also includes an extensive smart object library designed to make it easier to create videos, images, PowerPoint slides, RSS feeds, live information, and more. 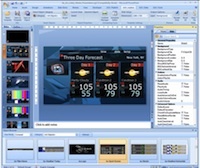 Xpresenter 3.0 incorporates the new Microsoft Office add-ins for PowerPoint, Word, and Excel. These Xpresenter Office add-ins appear as custom toolbars directly inside the Office Ribbon. The integration allows Xpresenter users to publish content directly from Office applications to display screens on the X2O network.